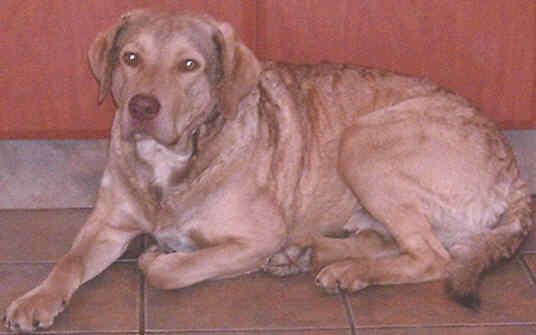 The Chesapeake Bay retriever originated in USA. The Bay is a long creek running inland towards Baltimore, on the East coast. In 1807 an English ship was wrecked off the coast of Maryland. There were two Newfoundland type puppies on board which survived the wreck. They grew up together, mated, then their descendants were crossed with curly coated retrievers and flat coated retrievers, and Otterhounds. How the different breeds of dogs originated. 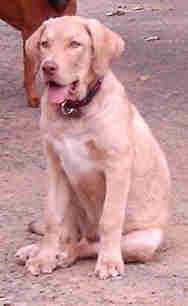 Chesapeake Bay retrievers were used for retrieving wild duck. "Retriever" means "One who brings back." The hunter would shoot a duck and the dog would bring it back, that is, "retrieve" it. Chesapeake Bay retrievers like to work, and love to go hunting, especially in water. They have webbed bare feet. The distinctive coat is thick and shortish - not more than 3.8cm long, with harsh, oily outer coat, and dense, fine woolly undercoat. A curliness s sometimes noted on the neck, back, and upper legs. The coat kept the dogs warm in snowy winters, and protected them from the icy waters of Chesapeake Bay. Colour: They can have the colour of dead grass (straw to bracken), or sedge (red-gold), or brown. 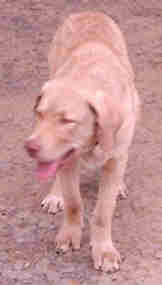 A Chesapeake Bay retriever is a strong, muscular dog, with a bright, happy disposition. They make brave guardians and companions. Out of a shipwreck, a new breed was born! Sometimes our plans are shipwrecked and we plunge into despair. But we can emerge a stronger, better person. Paul was shipwrecked three times - he was "in the deep," as he put it. But he did not give up his goal to tell the world about Christ, and he became one of the world's foremost Christian's, whose writings have endured to this day.